The publishing world has always been a tumultuous place. Magazines change ownership, management and names. Sometimes those strange paths hide information that may have been long forgotten. Or just a really funny fact. Jason "scored" this edition of Modern Shitbox, highlighting the Cimarron and other crap from history. 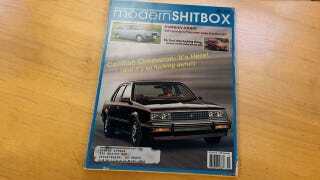 Going by the UPC on the cover, Modern Shitbox magazine has changed its title at some point since 1981. I like your thoroughness. I applaud you and your findings. Jason, what kind of reading material are you guys looking at during the day? Aren't there enough NSFW posts for you guys? No, I don't know what goes through Jason's head, either.